QRSS3 is slow Morse code, the '3' indicating 3s dit elements. Having very low modulation rate, it can be received in very narrow bandwidth such as achievable with packages like Spectran, Argo, and Spectrum Lab. 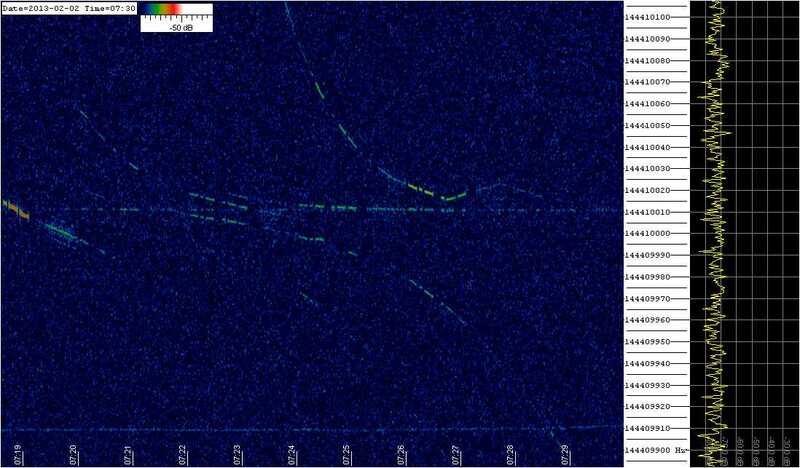 This article gives some hints for setup of Spectrum Lab for QRSS3 reception. 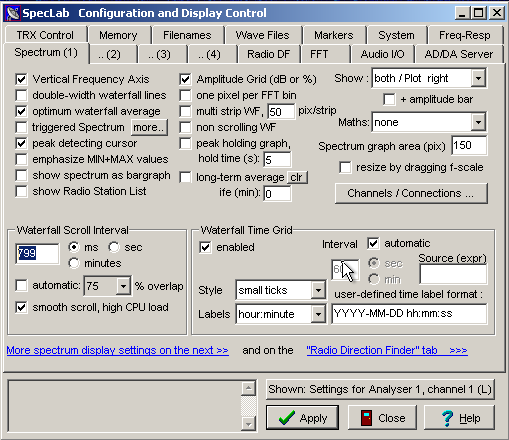 Fig 1 shows a spectrum grab that shows signal received, much of it with Doppler shift indicating reflection from aircraft. Key to useful display / decode is that the scroll speed isn't too fast and isn't too slow, and that resolution allows exploitation of S/N ratio in the narrow signal bandwidth (due to very low rate modulation). After all, this is why the QRSS3 can be decoded to 20dB or so lower in signal level than decoding 12WPM Morse in a SSB receiver by ear. The "Waterfall scroll interval" will depend on your window size, but 800ms is probably a good starting point. FFT settings are vital to achieving detection of the weak signals. The FFT bins need to be narrow for good S/N, but too narrow doesn't help and in the extreme will prevent seeing the modulation. Here the combination of sample rate, FFT block size and windowing gives an effective noise bandwidth (ENB) of 0.5Hz which is quite suitable to the fundamental frequency component of QRSS3 modulation. Even so, some propagation mechanisms will result in significant spectral dispersal (due to Doppler effects on a very small scale) and it is not unusual to see the 'direct' signal spread over several Hz. This is one of the reasons why QRSS3 was chosen instead of QRSS10 or QRSS30. 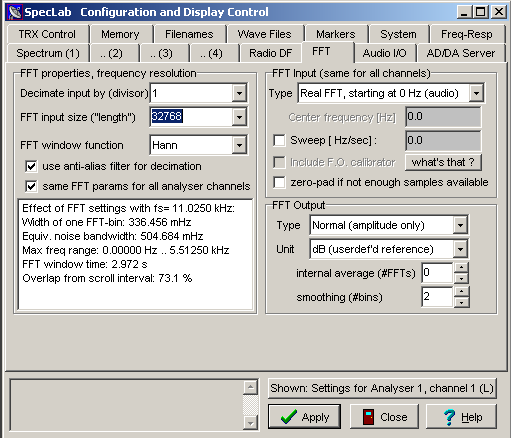 Then set your display to show around 200Hz centred on the signal. Next, apply your brain to the exercise. Though the 'direct' signal might not qualify for a Q5 report, by taking in the information available from concurrent aircraft reflections, known repetition rate of the keying message, relating repeated messages to fill in the gaps, you can make identification with very high confidence levels on very weak signals, signals down to SNR -30dB in K1JT terms. This is a whole lot stronger identification than the practice by some of 'spotting' a repeater or beacon because they hear (see) a very weak signal that happens to be on approximately the correct frequency... very weak evidence indeed. 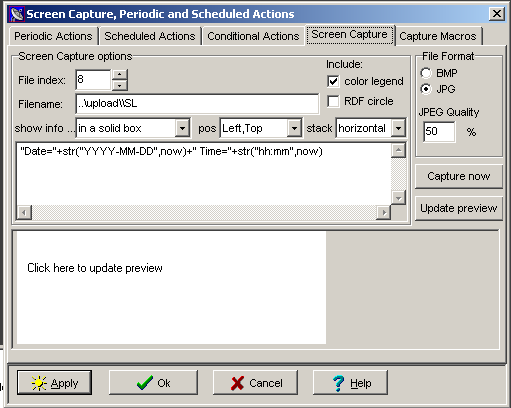 Spectrum Lab has a facility to save captures as an image file. Out of the box, the setting fro JPEG quality is higher than needed and results in Megabyte sized file. Setting JPEG quality to 50% (as above) will substantially reduce file size while preserving most of the value. Be careful not to create images that need resizing as resizing operations degrade quality severely... set your display window to a size appropriate to your saved image requirements.